This page is a portal to all of the daily station temperature data which the Met Office Hadley Centre has legal permission to disseminate from the studies on calm vs. windy trends by David Parker (Nature, 432, 290 (2004) and Journal of Climate, 19, 2882-2895 (2006)). Please note that some data were provided to us under the explicit condition that we did not onwardly disseminate them. These data are not provided here for this reason. The data are available as ASCII files on a station by station basis. They are daily maximum and minimum temperatures for the specified station. The data were used in the two publications to show that, on average over a wide range of locations, there is no discernible difference in the trends between windy and calm nights and hence that there is only likely to be a minimal urban heat island effect in the historical records used to estimate global warming over land. 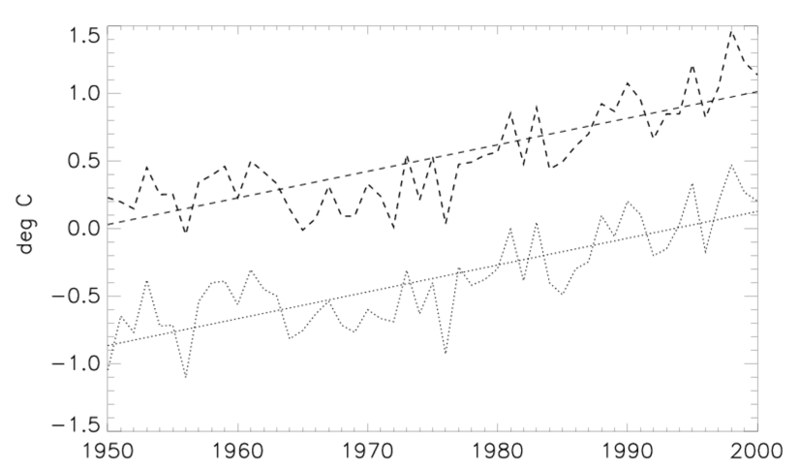 Timeseries for windy (dashed) and calm (dotted) night minimum temperatures, relative to the approximately 1961-1990 overall climatology, for a worldwide set of stations. There is no difference in the long-term trend behaviour.